Mahatma Gandhi and Nelson Mandela are set to have a cricket test series named after them, after the Board of Control for Cricket in India (BCCI) reached an agreement with their South African counterparts for the same. Starting in November, the test series between the countries will be known as 'The Mahatma Gandhi-Nelson Mandela Series', an announcement said on Monday, 31 August. 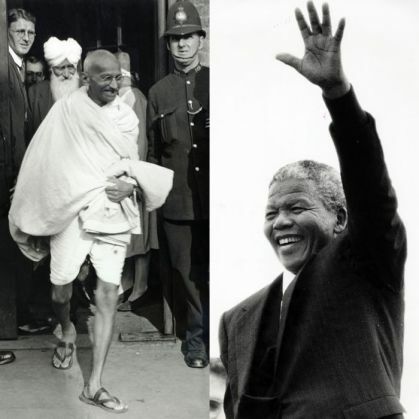 "For the people of both our countries there is no greater duty than to uphold the ideals of both Mahatma Gandhi and Nelson Mandela," Cricket South Africa Chief Executive Haroon Lorgat said in a statement. "As cricket loving people we must fight hard to win on the field of play but never forget to do battle in the spirit of these two great men." South Africa tour India for four tests in November and December, preceded by a series of limited over matches in October. The two countries have played 11 test series since 1992 with South Africa winning six and drawing three. Only the first series comprised four tests. A dispute between the two rival boards saw the last series in South Africa reduced to just two tests in 2013. Gandhi, who pursued non-violent protest to win Indian independence, lived in South Africa for almost two decades, working as a lawyer and leading several civil rights protests. Mandela, who died almost two years ago, spent 27 years behind bars for his fight against apartheid and then became South Africa`s first black president in 1994.